This suitcase is packed full with 40 different body parts and accessories to make hundreds of silly combinations! The wacky, mixed up looks for MR. POTATO HEAD characters that you create will keep you busy—and giggling—for hours! 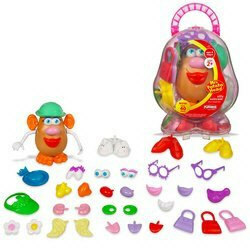 Potato body comes with tons of body parts and accessories! 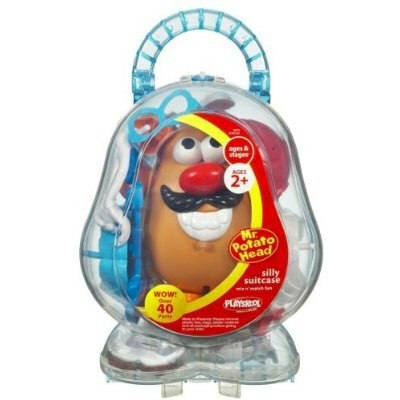 40 mix-and-match parts let you create loads of silly looks for the famous face-changing spud. “This suitcase is packed full with 40 different body parts and accessories to make hundreds of silly combinations! The wacky, mixed up looks for MR. POTATO HEAD characters that you create will keep you busy—and giggling—for hours! Potato body comes with 4 ears, 5 pairs of eyes, 2 sets of teeth, 4 mouths, 2 tongues, 4 noses, 3 mustaches, 1 pair of glasses, 2 earrings, 1 flower, 6 arms, 1 baseball hat, 1 construction hat, 1 visor, 1 pair of feet, 2 pairs of shoes and carry case.